Raise your hand if you have ever DREADED filling up your social media sharing queue? We all know blog marketing is important…but automating, managing, and maintaining your channels can be tiring, boring, and even frustrating. Well, SmarterQueue is here to save the day. SQ is a social media management and automation tool. 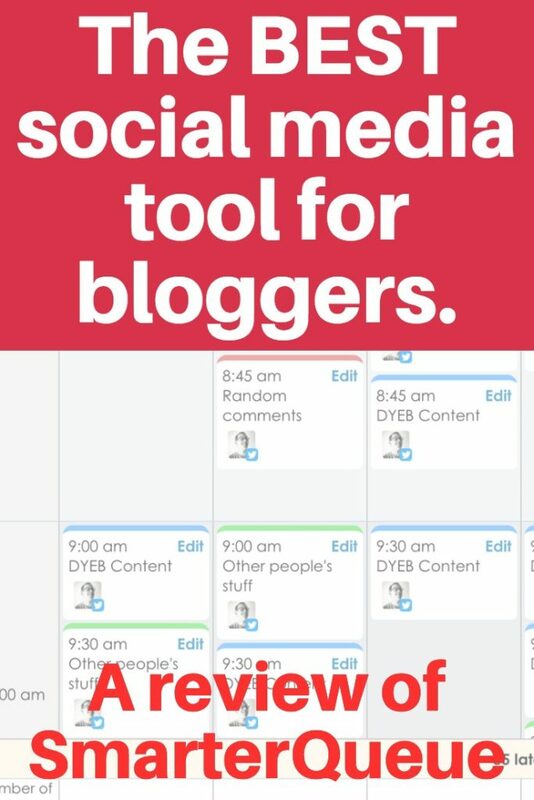 Most bloggers use these tools to load “share queues” with their blog content (and other people’s content), to pre-schedule posts to Twitter, Facebook, Pinterest, Instagram, LinkedIn, etc. 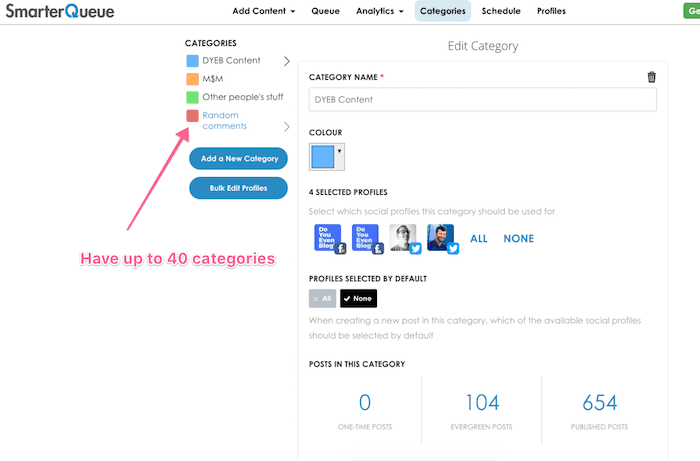 In addition to scheduling content to be shared, most tools like SQ come with built-in analytics so you can judge which pieces of content perform, at what times, to which platforms, etc. SQ has incredible analytics AND evergreen content recycling, making it one of the most powerful social media tools I’ve seen. Full disclosure: Throughout my blogging career, I’ve used Hootsuite, Buffer, AND Hootsuite. I’ve been around the block social media wise. For the past 2 years, I’ve been paying $110/year for Buffer Pro, which I was more or less satisfied with. The Buffer Chrome extension is great. The features were pretty standard. Overall, Buffer worked out well, but there was a huge issue: it still took A TON of my time every week to add content to my queues and keep things updated. 2 months ago I got sick of it, and started shopping around again. After grumbling at the $50/month price tag of MeetEdgar for about an hour, I eventually some random blogger mentioning they switched to SmarterQueue. And what’s the next page I generally look at? Way less than MeetEdgar, with more features. Last but not least, the free trial sold me. I decided to pause my Buffer queue and try out SQ for a few weeks to try it out. By the way, you can view my recommended blogging tools for beginners here, or all of the tools I personally use on my resources page. First, if you’d like this in video form, watch it below! And coming soon? Pinterest and Google+. This is where SQ REALLY shines. You have do set this for every single social profile. It’s annoying. 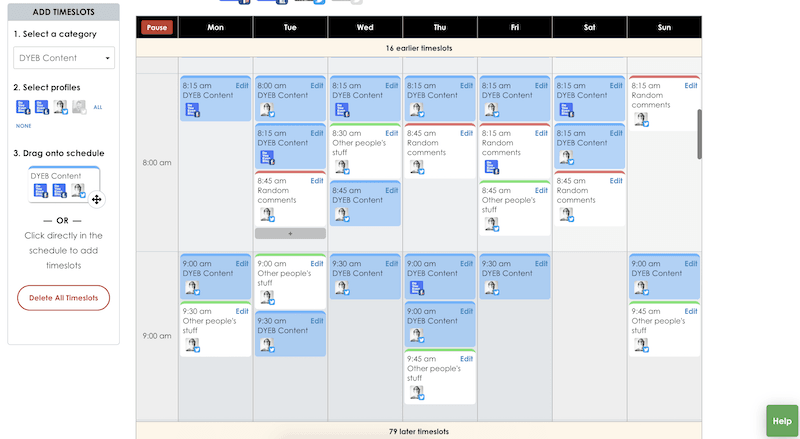 You can either drag-n-drop different categories/social profiles straight to the calendar, click within the calendar, OR have SmarterQueue analyze your social profiles and create a custom schedule automatically. Yup. 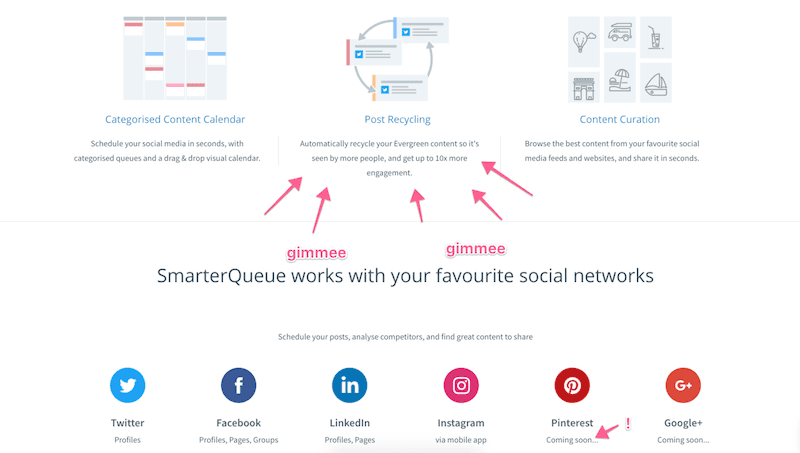 When you first sign up and connect your social profiles, SmarterQueue can dig back through your old content on Twitter, Facebook, etc, and create a schedule for you! 4 – You add content! While SQ doesn’t currently have a Chrome extension, they DO have a link you can bookmark, and simply click to share from any website. 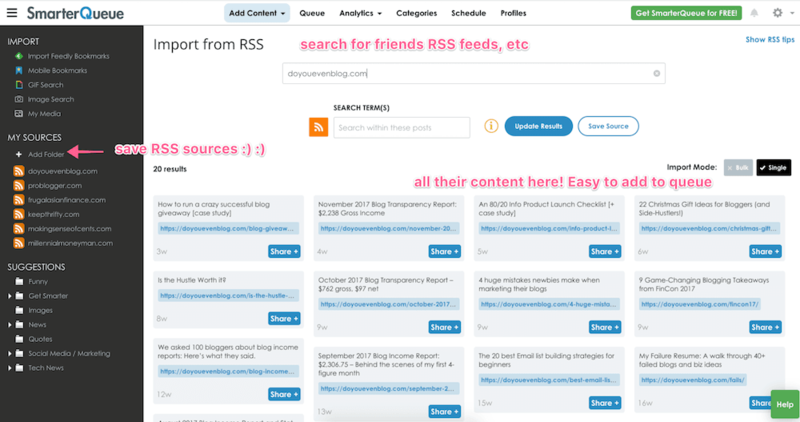 In addition, the ability to add and save RSS feeds for adding content is absolutely amazing. 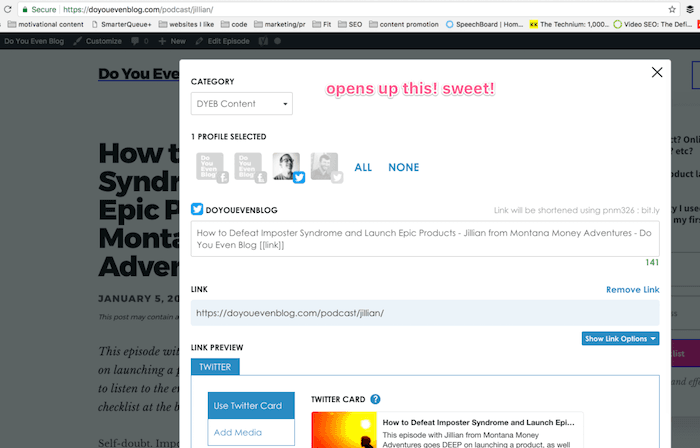 Check out the add-content dashboard within SQ itself. 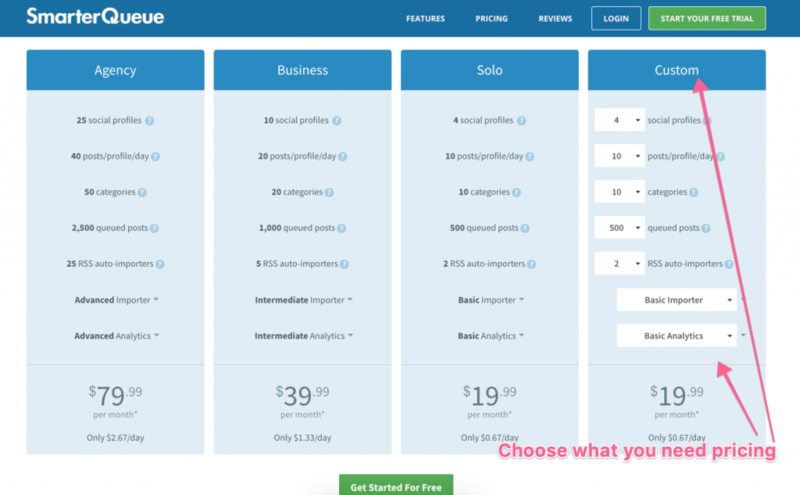 For the price, SmarterQueue’s analytics are FAR superior to that of both Buffer and MeetEdgar. 1- You can analyze any social media account on the web. Not just yours. This provides an incredible amount of insights. What types of tweets get more retweets, those with pictures or those without? Those with links or those without? Which hashtags get me the most likes and engagement? All of THOSE question. It’s insanely useful. Here’s an example from my own Twitter account. What other blogger mentions get me the most retweets? View each evergreen post and compare cycles! Gimme a break. Only 200 followers right now. I.e. you want to see some fancy graphs and statistics over a set period of time. I.e. My Instagram page over the past 3 months. No screenshots needed, but it is pretty handy. The draw to both of these platforms is the ability to RECYCLE content automatically, so you don’t have to log-in to the platform every day to schedule your content. It’s an amazing feature, and one people are generally willing to pay more for. But how much more?? Did I mention way better pricing? Buffer is the old dog in this fight, and has had good market share for years. However, their dashboard and features haven’t gained much in years. That’s about it. In a SmarterQueue vs Buffer vs MeetEdgar showdown, SmarterQueue will get the knockout every single time. Why does SQ get my full recommendation for bloggers? What are my favorite parts? Straight-up, evergreen content recycling will save bloggers a LOT of time…without breaking your bank account. It’s still a user-friendly dashboard anyone can navigate, while still providing an incredible amount of features for the price point. So, is SmarterQueue right for you? If you’re looking to step up your game with advanced analytics and scheduling flexibility, and want to save time on scheduling, it’s an absolutely steal at their price point. I’m a power user now, and have no intention of trying anything else. Question for you, are you going to give SmarterQueue a try? Comment below! I am really going to look into it as I too have struggled with Buffer a little bit but then again I only have the free plan. It seems like this tool would help me bridge some scheduling issues I currently run into that just are very time-consuming. However, what I can’t tell from your post is there a mobile app that can be used to create content to share later or does it all have to be done via the Web App. Edit: Ok apparently the mobile app is mainly just to release your Instagram queue at the moment, thought opening SmarterQueue on your phone’s browser does work (i.e. is mobile friendly, can edit the queue, etc). Wow – so I actually read this review with no intent of trying out SmarterQueue… but now I’m thinking about trying it. I’ve used Hootsuite before, but stopped using it after they reduced social media scheduling from unlimited to 30 (I like to schedule in batches). Thanks! Signing up with your 30 day trial now! I used Hootsuite for awhile but I hated the notice on each post that says “posted by hootsuite.” I have a new social media management responsibility and am looking for a more genuine looking way to schedule posts. Something that looks like it was posted organically within facebook, not automated. Does Smarterque add their name to posts like Hootsuite did? It’s a dealbreaker for me. Honest to goodness I don’t know. I don’t THINK so, (Check this screenshot). Hey Pete, I started the free trial and I really do like it. I have an issue and I’m wondering if there’s anything I’m missing. When I search for content in SQ, I can share the post but then it’s copying the text to twitter\facebook. It’s not doing a “retweet” or regular share on FB. Do you know if there’s an option to schedule a share and retweets? I don’t like the copying text thing. It looks a little weird on Twitter, and on Facebook, it doesn’t even show the original page that I shared it from. Are you referring to putting separate text for the different social platforms? You can definitely customize for each. Thank you, I’ll check with their support. I didn’t mean editing the text for the different platforms. What I meant: When I choose “add content” in the top bar and then choose “find content” I can search for a facebook page (other then mine) for example. Then I get results, which I can click the share button on each result and then choose “share full post”, but all that does, is copying the image and text. When it gets posted, it doesn’t look like I shared a post from someone else. It looks like I uploaded their picture and wrote my own text. If I go to FB and share someone else’s content from FB itself, it’s displayed with their info, their page, the option to like their page etc. As for Twitter, SQ copies the text, and creates “via @username”. It’s not in a form of a retweet. So there’s no differentiating what I wrote and what the original text is. So my problem is that it looks like I’m copying from someone, not sharing their content. Even if I link\mention them, it doesn’t look like a share\retweet but that’s what I would like for it to be. Thank you for trying to help and I would reach SQ as well. ooooo ok this is perfect. Wow! This is great detail on this platform! I have a ton of content that I’ve organized and is ready to start rolling out, but once I create all the variations, I’m worried I’m going to get lost in it and not have things post. This might be the perfect tool. I’m curious, a lot of people are now talking about the direct upload vs through a service and that your algorithm is affected when it’s not a direct post. Have you been affected? Love your blog! I’ve got to ask though – even on autopilot, is it still worth the hassle of doing all this for less than 3% organic reach on FB? For FB pages specifically? Probably not. However, you can also schedule to private groups you run as well. Handy for group engagement. I mainly use for Twitter, IG, and Pinterest nowadays.